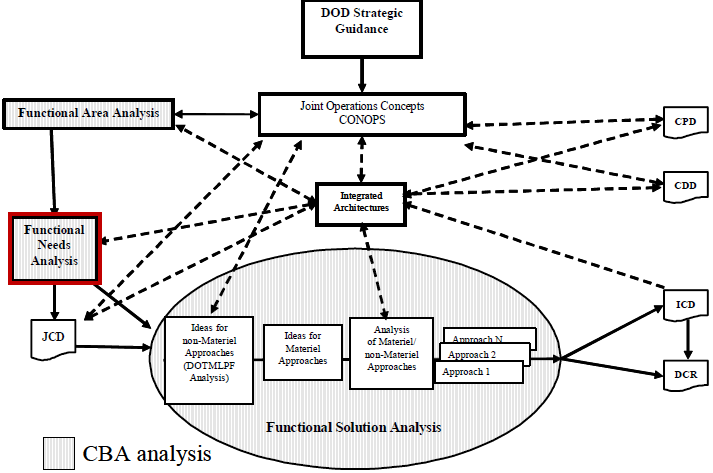 A Functional Needs Analysis (FNA) assesses current and future capabilities to meet the military objectives of the scenarios chosen in the Functional Area Analysis (FAA) and is an output of the Capabilities Based Assessment (CBA). Using military scenarios, the FNA assesses whether or not an inability to achieve a desired effect exists to determine if there is a capability gap. The FNA also identifies any capabilities that have overlaps or redundancies which allows for streamlining efforts. Below is the JCIDS process map and where the FNA fits in the the CBA. List the gaps that should be address or conclude that no pressing gaps exist. The current CJCSI 3170.01G does not reference an FNA. It rolls it up under a Capabilities Based Assessment (CBA). You have to view previous versions of the 3170 to get a description of a FNA.